The explosive Thomas fire driven by ferocious Santa Ana winds has now devastated nearly 60,000 acres, 70 square miles with zero percent containment by Tuesday evening. Multiple homes in the area of Scenic Way Drive in Ventura could be seen burning from the air. In downtown Ventura, the Hawaiian Village apartment complex was engulfed in flames according to abc7. More than 7,000 homes in Ventura County were under mandatory evacuation as the blaze closed in on downtown Ventura, where multiple structures were reportedly burning. Fire officials said 27,000 people were evacuated from their residences. California Governor Jerry Brown declared a state of emergency, freeing state funds and resources to assist the more than 1,000 firefighters battling to save homes from the conflagration. “This fire is very dangerous and spreading rapidly, but we’ll continue to attack it with all we’ve got,” Brown said in a statement. There were no immediate reports of fatalities from the blaze but KABC-TV reported that one person was killed in a car crash while fleeing the area. “Due to the intensity of the fire, crews are having trouble making access and there are multiple reports of structures on fire,” officials said on Ventura County’s emergency management website. More than 250,000 homes were without power, utilities said. All schools in the Ventura Unified School District were closed. 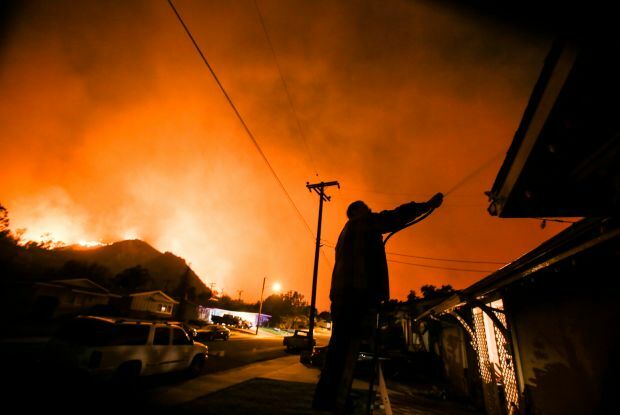 The Thomas Fire was the largest of several large blazes that broke out across Southern California following the onset of the Santa Ana winds. According to Reuters, in the San Fernando Valley north of Los Angeles, the so-called Creek Fire had blackened more than 11,000 acres and forced the evacuation of 2,500 homes and a convalescent centre north of Interstate 210.